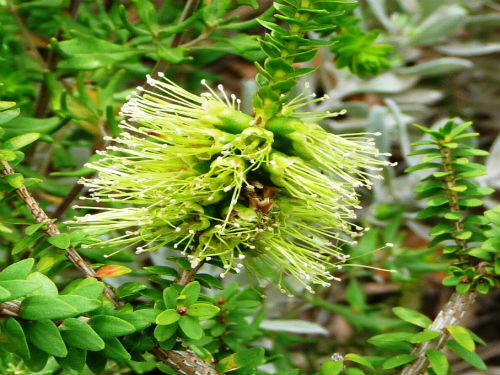 Melaleuca diosmifolia is a dense shrub reaching a height of three metres. Leaves are spirally arranged, elliptical and crowded around the stems. Juvenile leaves are light green whilst adult leaves become darker. Flowers are arranged in cylindrical, bottlebrush-like, lime-green spikes. The spikes are an unusual colour. Flowering occurs in spring and early summer. Growth habit, foliage and flowers are attractive features. Tip pruning will improve foliage density. This in turn will provide safe nesting sites for small native birds. M. diosmifolia could be cultivated in hedges and screens. This handsome shrub is a native of the southern coast of Western Australia. The species name means with similar foliage to the genus Diosma, an African heath plant. M. diosmatifolia has a similar name but is a native of eastern Australia. Both species names have the same origin.